Ask a dozen people about their greatest fears, and you’ll likely get a dozen different responses. That, along with the complexity of the human brain, makes fear—and its close cousin, anxiety—difficult to study. For this reason, clinical anti-anxiety medicines have mixed results, even though they are broadly prescribed. In fact, one in six Americans takes a psychiatric drug . A team of investigators from the Salk Institute uncovered new clues about the mechanisms of fear and anxiety through an unlikely creature: the tiny nematode worm. 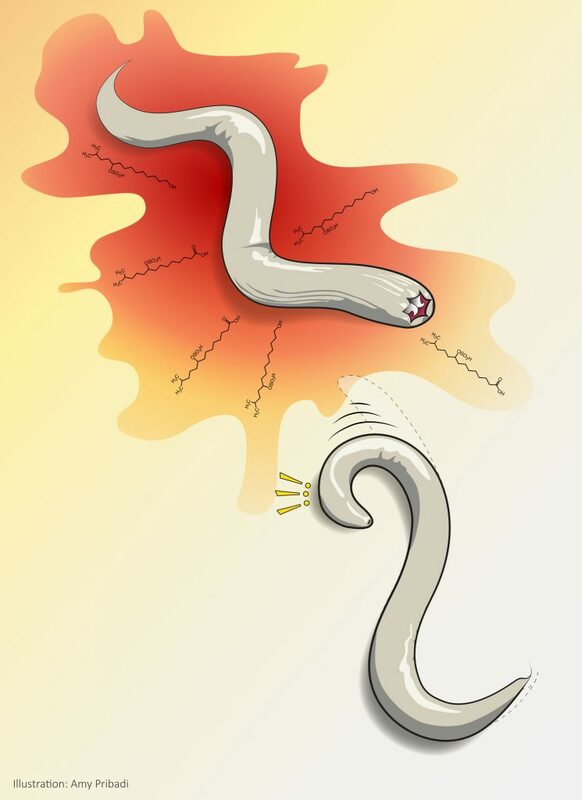 By analyzing the responses of worms exposed to chemicals secreted by its natural predator and studying the underlying molecular pathways, the team uncovered a rudimentary fear-like response that has parallels to human anxiety. Such insights may eventually help refine prescriptions for current anti-anxiety drugs and enable the development of new drugs to treat conditions like PTSD and panic disorder. The team at Salk started with a simple creature, the microscopic worm called Caenorhabditis elegans. C. elegans, which contains only 302 neurons, has a natural predator—another worm called Pristionchus pacificus, which bites and kills C. elegans. The researchers discovered that by exposing C. elegans to chemicals that are excreted by P. pacificus, they could elicit a fear-like response. When it encounters these predator-excreted chemicals, C. elegans rapidly reverses direction and crawls away. They found that this fear-inducing chemical, a new class of molecules called sulfolipids, could activate four redundant brain circuits that led to this behavior. Additionally, C. elegans continued to change its behavior even after the fear-chemical was removed. This is analogous to behavior in mice, who express fear when exposed to the scent of cat urine, even if a cat is nowhere nearby. In the experiment, coauthor and UC San Diego graduate student Amy Pribadi soaked C. elegans in a solution containing the sulfolipid for 30 minutes. The worms failed to lay eggs, even for an hour after they had been removed from the solution—an indicator of acute stress as well as a longer-term response akin to anxiety. Further research showed that the signaling pathways activated during the worms’ response are similar to the pathways activated when more complex animals experience fear. When the worms were soaked in a solution containing Zoloft (a human anti-anxiety drug), however, these fear- and anxiety-like responses were not observed. This suggested that at least some of the pathways that the drug acts on to eliminate anxiety in mammals have been preserved by evolution. Also intriguingly, the team found that Zoloft acted on the worms’ GABA signaling in a neuron that affects the animal’s sleep. Whether this is also the case in humans is not yet known, but points to a potential pathway to understand why Zoloft works in some people and not others. The research eventually could lead to a change in how these drugs are prescribed. 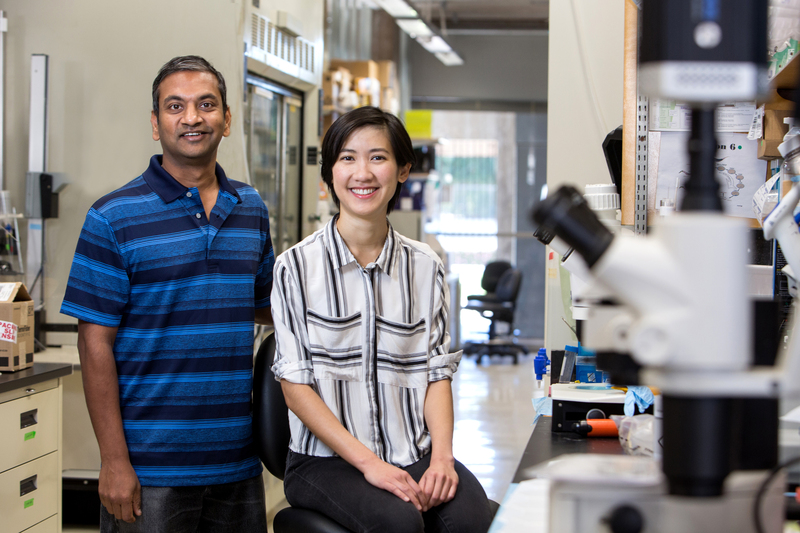 The paper’s other authors were Zheng Liu, Maro J. Kariya, Christopher D. Chute, Sarah G. Leinwand, Ada Tong, and Kevin P. Curran of Salk; Neelanjan Bose and Frank C. Schroeder of Cornell University; and Jagan Srinivasan of Worcester Polytechnic Institute. This work was funded by the W. M. Keck Foundation, the National Institutes of Health and a Salk Alumni Fellowship.